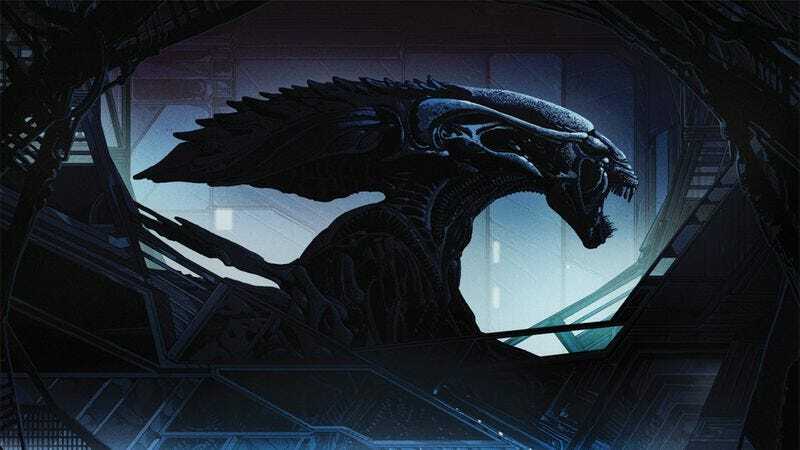 April 26th is now Alien Day, a reference to LV-426, the planet where the Xenomorphs were originally found in 1979’s Alien (If you don’t know, now you know.) Mondo and Alamo Drafthouse are celebrating 4/26 with a double feature of the original film, as well as James Cameron’s war-movie sequel. In addition to T-shirts, posters, and knitware, Mondo will be releasing the soundtracks to both Aliens and Prometheus on wax, and The A.V. Club has an exclusive look. James Horner’s Aliens score will be reissued on standard vinyl, as well as a very limited edition (75 copies) clear wax with green “Xenomorph” blood inside. It’s exciting news for Aliens fans, the James Cameron faithful, and ’90s action movie trailer enthusiasts who can hum “Bishop’s Countdown” note for note. The Mondo release will also feature several alternate takes and musical cues not featured in the film. And the Prometheus score, from composer Marc Streitenfeld, will be pressed on heavyweight grey splatter vinyl (limited to 1,000 copies) as well as standard black vinyl. Both releases will feature artwork by Kilian Eng and are slated for release April 26, 2016.